QAMISHLI, Syria (Reuters) - The U.S.-backed Syrian Democratic Forces (SDF) began an assault against the final Islamic State enclave in eastern Syria on Saturday, aiming to wipe out the last vestige of the jihadist group’s “caliphate” in the SDF’s area of operations. President Donald Trump, who is planning to pull U.S. forces out of Syria, said on Wednesday he expected an announcement as early as next week that the U.S.-led coalition operating in support of the SDF had reclaimed all the territory previously held by the jihadist group. SDF official Mustafa Bali, speaking to Reuters, described the assault as “the last battle”. He later wrote on Twitter that the attack had started and the enclave would “be cleared soon”. The SDF had handled the last 10 days “patiently” as more than 20,000 civilians were evacuated from the besieged IS enclave, Bali said. 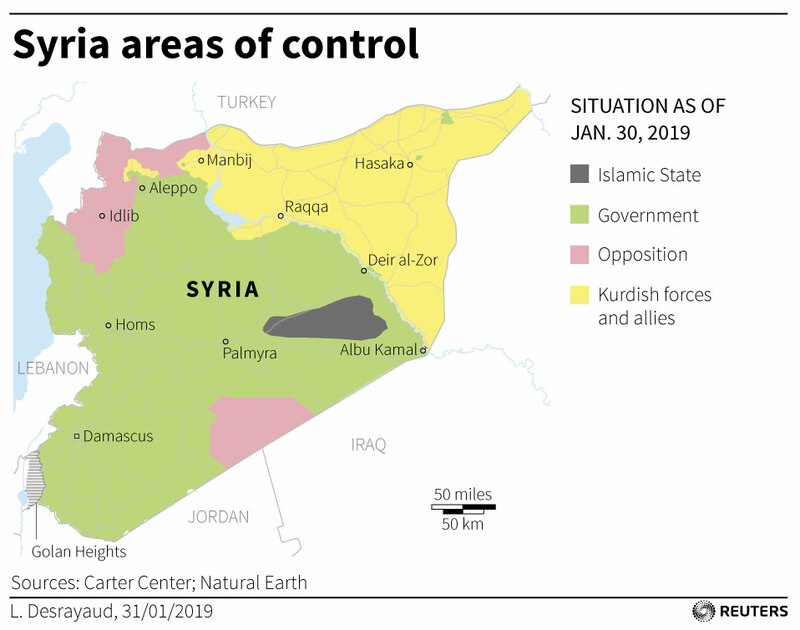 Senior SDF official Redur Xelil told Reuters the force hoped to capture the area by the end of February, but cautioned that IS would continue to pose “great and serious” security threats even after that. Islamic State redrew the map of the Middle East in 2014 when it declared a caliphate across large areas of Syria and Iraq. But the group steadily lost ground and its two main prizes - the Syrian city of Raqqa and Iraq’s Mosul - fell in 2017. Two U.S. security sources said the U.S. government’s top experts strongly believe IS leader Abu Bakr al-Baghdadi is still alive and possibly hiding in Iraq. Spearheaded by the Kurdish YPG militia, the SDF has been the main U.S. partner in Syria and has driven Islamic State out of a swathe of the north and east over the last four years. The remaining Islamic State territory in Syria is west of the Euphrates. Trump said in December he was pulling all 2,000 U.S. troops out of Syria, saying the battle against Islamic State there was almost won. But a top U.S. general said on Tuesday the group would pose an enduring threat following the U.S. withdrawal, as it retained leaders, fighters, facilitators and resources that would fuel a menacing insurgency. The Wall Street Journal reported on Friday that the U.S. military was preparing to withdraw from Syria by the end of April. A U.S. official confirmed that target date to Reuters, saying the withdrawal included a pull-out from the U.S. military base at Tanf, near the Syrian border with Iraq and Jordan. The U.S.-led coalition has said it is not discussing the timeline of the U.S. withdrawal from Syria.